Designed by designojo, United States. Epoca is family-owned business that designs, manufactures and distributes a wide range of kitchen accessories and appliances. 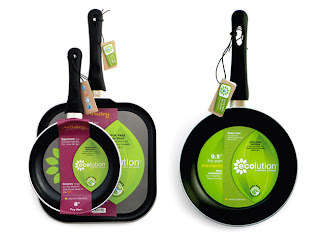 In 2009, Epoca planned to launch a new line of cookware- Ecolution, the line was the companies first “green” product and featured a toxin-free, non- stick coating. For the Ecolution project, designojo created the visual platform for the 3 tier line, packaging graphics and copy for over 30 sku’s, and a visual style guide that included sub-brand identities, point of sale graphics, and the design templates for the Ecolution website.